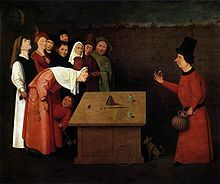 The shell game (also known as Thimblerig, Three shells and a pea, the old army game) is portrayed as a gambling game, but in reality, when a wager for money is made, it is almost always a confidence trick used to perpetrate fraud. In confidence trick slang, this swindle is referred to as a short-con because it is quick and easy to pull off. In the shell game, three or more identical containers (which may be cups, shells, bottle caps, or anything else) are placed face-down on a surface. A small ball is placed beneath one of these containers so that it cannot be seen, and they are then shuffled by the operator in plain view. One or more players are invited to bet on which container holds the ball - typically, the operator offers to double the player's stake if they guess correctly. Where the game is played honestly, the operator can win if he shuffles the containers in a way which the player cannot follow. In practice, however, the shell game is notorious for its use by confidence tricksters who will typically rig the game using sleight of hand to move or hide the ball during play and replace it as required. Fraudulent shell games are also known for the use of psychological tricks to convince potential players of the legitimacy of the game - for example, by using shills or by allowing a player to win a few times before beginning the scam. The shell game dates back at least to Ancient Greece. It can be seen in several paintings of the European Middle Ages. A book published in England in 1670 (Hull Elections-Richard Perry and his fiddler wife) mentions the thimblerig game. In the 1790s, it was called "thimblerig" as it was originally played using sewing thimbles. Later, walnut shells were used, and today the use of bottle caps is very common. "My first visit to Epsom was in the May of 1856 - Blink Bonnie's year. My first Derby had no interest for me as a race, but as giving me the opportunity of studying life and character it is ever to be gratefully remembered. Gambling-tents and thimble-rigging, prick in the garter and the three-card trick, had not then been stopped by the police. So convinced was I that I could find the pea under the thimble that I was on the point of backing my guess rather heavily, when I was stopped by Egg [Frith’s companion], whose interference was resented by a clerical-looking personage, in language much opposed to what would have been anticipated from one of his cloth. 'You,' said Egg, addressing the divine, 'you are a confederate, you know; my friend is not to be taken in.' 'Look here,' said the clergyman, 'don't you call names, and don't call me names, or I shall knock your d - d head off.' 'Will you?' said Egg, his courage rising as he saw two policemen approaching. 'Then I call the lot of you - the Quaker there, no more a Quaker than I am, and that fellow that thinks he looks like a farmer - you are a parcel of thieves!' 'So they are, sir,' said a meek-looking lad who joined us; 'they have cleaned me out.' 'Now move off; clear out of this!' said the police; and the gang walked away, the clergyman turning and extending his arms in the act of blessing me and Egg." Fear of jail kept these shell men traveling from one town to the next, never staying in one place very long. One of the most infamous confidence men of the nineteenth century, Jefferson Randolph Smith, known as Soapy Smith, led organized gangs of shell men throughout the mid-western United States, and later in Alaska. 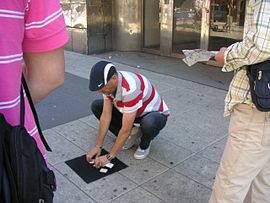 Today, the game is still being played for money in many major cities around the world, usually at locations with a high tourist concentration (for example: New York, Chicago, and Los Angeles, in the United States, La Rambla in Barcelona, Spain, Gran Via in Madrid, Paris in France, Kurfürstendamm in Berlin, Germany, Bahnhofsviertel in Frankfurt am Main). The swindle is classified as a confidence trick game, and illegal to play for money in most countries. The game also inspired a pricing game on the game show The Price Is Right, in which contestants attempt to win a larger prize by pricing smaller prizes to earn attempts at finding a ball hidden under one of four shells. While the ball is not shown during the game, and the host shuffles the shells before the start of the game, contestants can win by either winning all four attempts or winning enough attempts, and picking the one that has the ball. How do big city shell games work?